On October 24 the Orient-Institut in Cihangir was packed with an enthusiastic audience ready to hear the historian Dr Philip Mansel talk about the economic, political and cultural alliances that existed between the Ottoman Empire and European strongholds for over three centuries. Istanbul was so important during the Ottoman Empire, Dr Mansel began, that ambassadors who were sent there often went on to have highly lucrative foreign diplomat careers. A good example is the Comte de Vergennes, the French ambassador to Istanbul in the mid-18th century (his portrait, above, painted by Antoine de Favray in 1766, is on display at the Pera Museum as part of the Intersecting Worlds exhibition). Dr Mansel's lively lecture focused on each ‘friend’ of the Ottoman Empire individually. 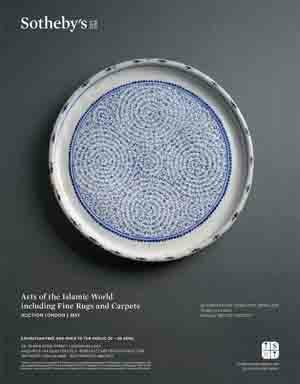 Fascinating titbits of information were accompanied by visual examples, the majority of them paintings commissioned by the various ambassadors. 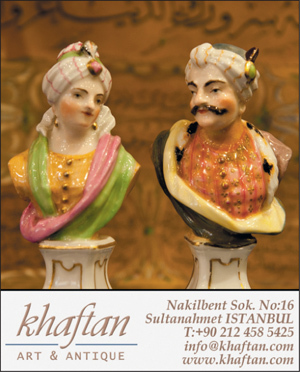 The Ottomans had friendly relations and treaties with a number of countries. Transylvania was one of the first to form an alliance and was a tributary principality of the Empire in the mid-16th century (today it has a repository of the richest and best-preserved Turkish carpets outside the Islamic world). 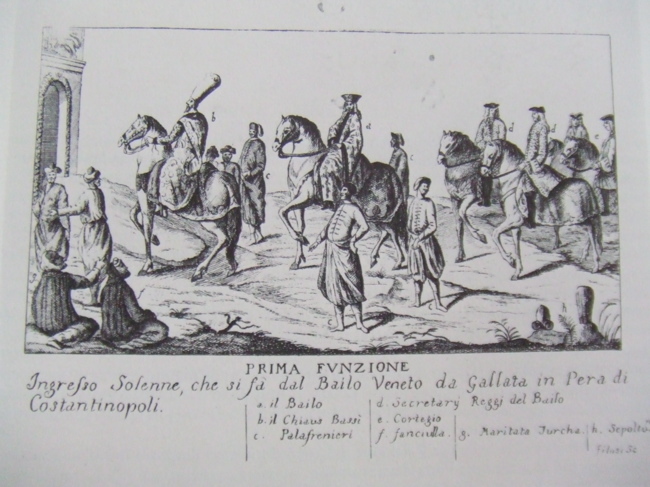 In 17th-century Venice more books were written about the Ottoman Empire than any other, and the image above shows an example of a drawing depicting the Bailo of Venice entering Pera (date unknown) that would have been found in such a book. But the Ottoman Empire's most important alliance was undoubtedly with France. From the moment the first French ambassador arrived, in the mid-16th century, the French-Ottoman alliance became ‘one of the few fixed points in European diplomacy’. The ‘fully functional military, as well as political, alliance’ was so strong, according to Dr Mansel, that it wasn't long before the French started calling their sons Constantine. The long-term consequences of this alliance were well captured at the recent Treasure of the Holy Sepulchre exhibition at Versailles. One of the most important painters to come out of the French-Ottoman alliance was Jean-Baptiste Vanmour, who arrived in Istanbul in 1699 in the suite of the French ambassador, the Marquis de Ferriol. 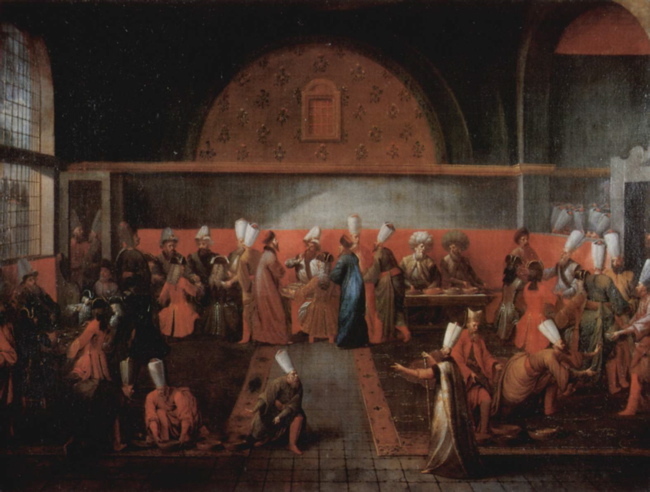 Vanmour is often credited with capturing the ‘European-Ottoman intimacy’ most comprehensively. There are no equivalent paintings of ambassadors in other European cities during this period, Dr Mansel told us. Vanmour remained in the city until his death in 1737 and painted hundreds of pictures during his lifetime (a number of these are on display at the Intersecting Worlds exhibition). 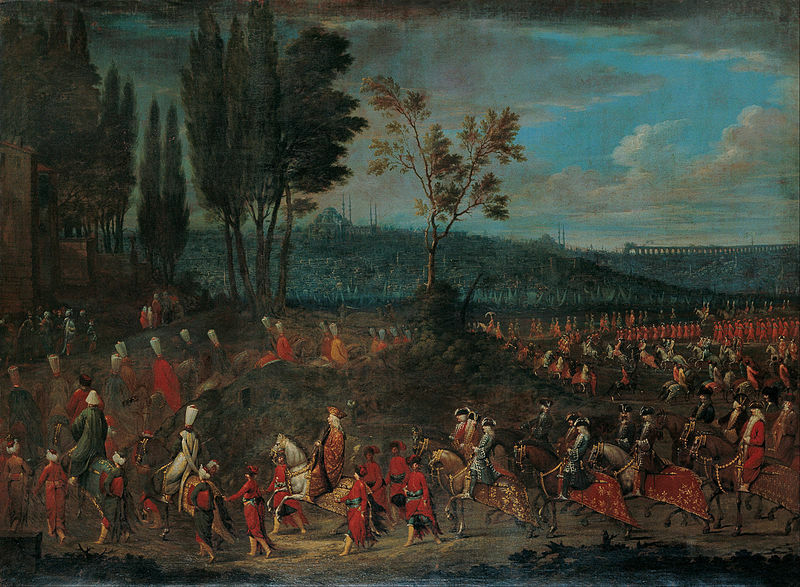 The above image shows Vanmour’s 1724 painting of the reception of the French Ambassador, Comte d’Andrezel, by Sultan Ahmed III, at a dinner hosted by the grand vizier, Ibrahim Pasha. Another favourite subject was the ambassadorial procession. These had to be very flash ‘if you were an ambassador worth your weight’, according to Dr Mansel. The rumour was that ‘every window was packed’ when a procession was taking place. 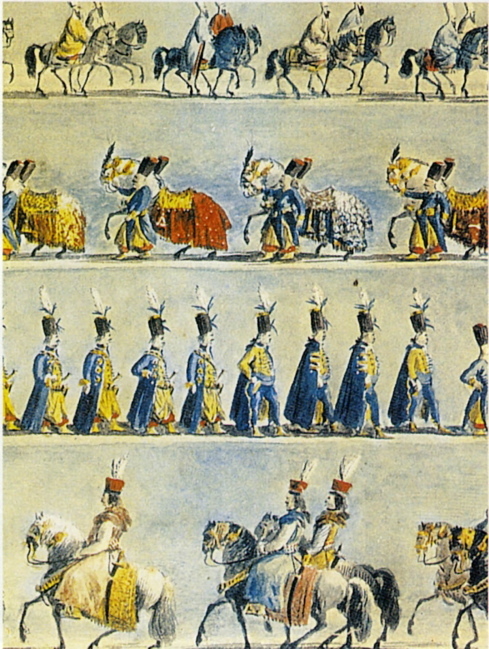 The above image shows an ambassadorial procession painted by Vanmour sometime in the first half of the 18th century. Dr Mansel alerted us to the number of accompanying janissaries – a telltale sign of the importance of an ambassador. Vanmour did not paint only ambassadors and the court – he was also interested in Istanbul’s other power structures. The painting of his above, completed in 1817, shows the revolutionary figure Patrona Khalil, a former marine who instigated the mob uprising that resuled in the replacement of Sultan Ahmed III with Mahmud I in 1730. 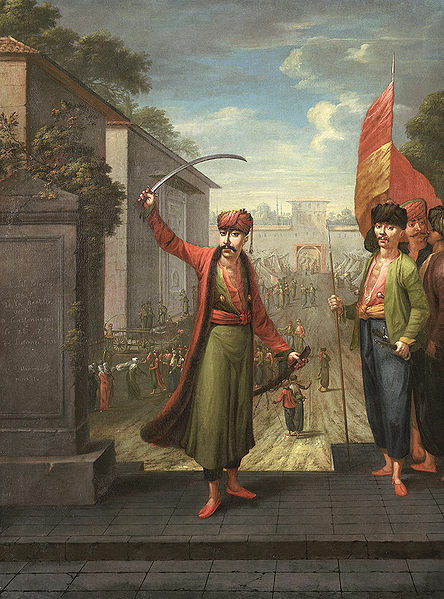 The Rijksmuseum in Amsterdam holds the largest collection of Vanmours painted during his time in Istanbul. 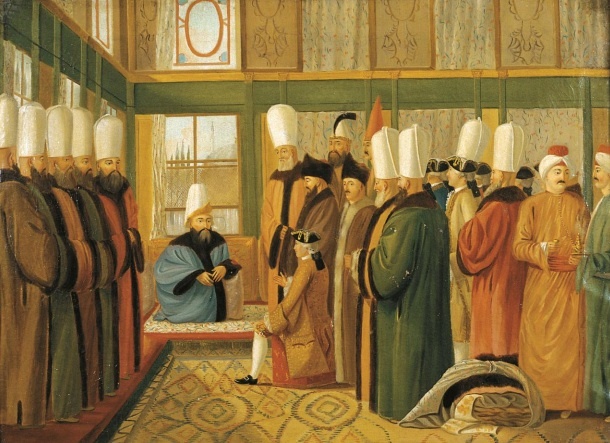 European-Ottoman relations were often based on trade. French trade (through Marseille) was extensive and was rumoured to have ‘kept half of Provence alive’, Dr Mansel told us. Interestingly, there were no mosques in Marseille until the 20th century. In the early 17th century, Dutch-Ottoman relations warmed up. They shared the same enemy (Spain) – a factor that often brought regions together. 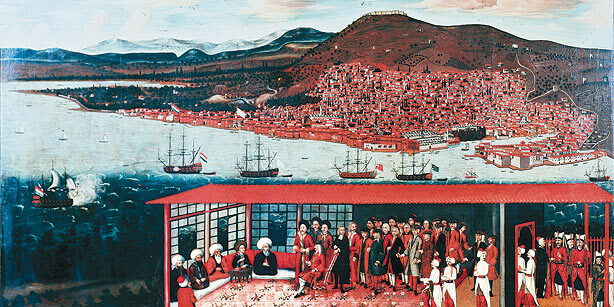 The above anonymous painting from the late 17th or early 18th century depicts the presentation of the Dutch consul Jan Baron Daniel de Hochepied in Izmir. Another ally was Poland. The relationship brewed in the 16th century, when Suleiman the Magnificent was apparently on ‘brotherly’ terms with the Polish king Sigismund II Augustus. Three wars between Poland and the Ottoman Empire in the 17th century cooled the relationship but eventually they became friends again. The Ottoman Empire’s 1768 declaration of war on Russia was mostly in order to get Polish troops out of Russia. Polish dress was greatly influenced by Ottoman styles and King Stanisław I Leszczyński built Turkish-style kiosks in Lorraine. The above 1790 painting by Luigi Mayer shows Governor Piotr Potocki and his embassy entering Pera. Mayer was one of the most important late 18th-century European painters of the Ottoman Empire , and produced over 400 views of Istanbul. Dr Mansel hopes for an exhibition, and so do we. Sweden’s alliance with the Ottoman Empire dates from the early 17th century. Dr Mansel tells us that Selim III made formal written alliances with Christian powers, including Sweden. When Sweden failed to observe the agreement (and betrayed the Empire by secretly signing a treaty with Catherine the Great), the Sultan remarked: ‘Infidels are so unreliable.’ One of the most impressive collections of paintings showing the Swedish-Ottoman alliance is the Celsing Collection. Gustaf Celsing was a diplomat sent as an envoy to Sultan Mehmed IV’s court by King Charles X in 1657. Following in their father’s footsteps, Celsing’s sons would become Swedish ambassadors to Turkey in the mid-18th century. The fate of the collection of paintings each Celsing commissioned during his post ‘hangs thick in the air’, Dr Mansel tells us, for the Celsing family wants to sell. The above painting shows Gustaf Celsing in an audience with the grand vizier (date unknown). Diplomatic relations between Britain and the Ottomans was established in the late 16th century, though the alliance reached its zenith in the 18th and 19th centuries. 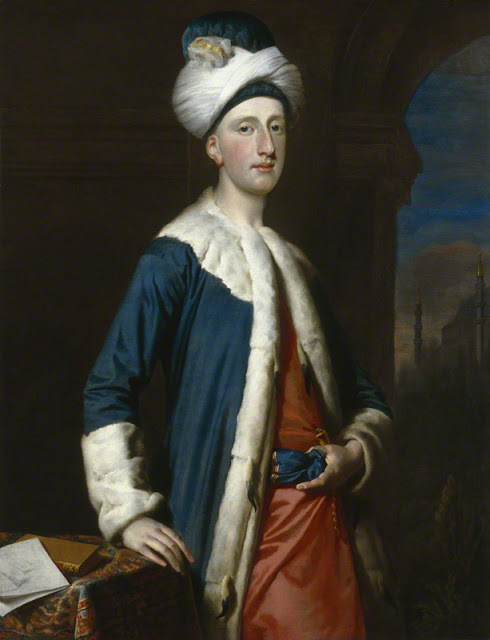 The above (top) painting shows John Montagu, Fourth Earl of Sandwich, in Turkish dress, painted by Joseph Highmore in 1740. 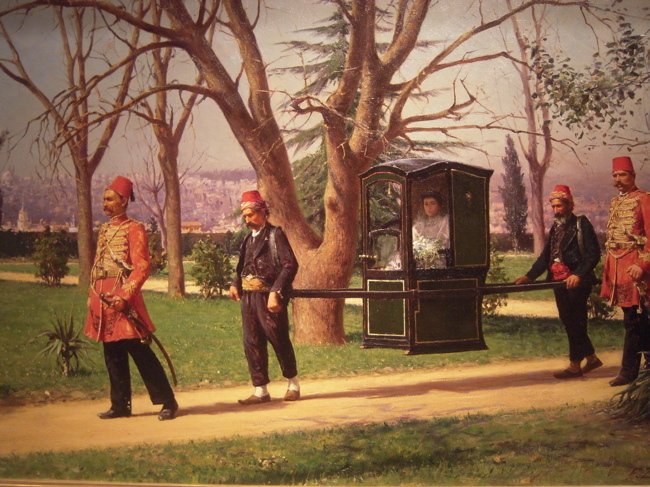 Fausto Zonaro, an Italian painter known as the ‘darling of the palaces’, according to Mansel, was the man behind the famous painting (above bottom) depicting the British ambassador’s daughter being carried through an Istanbul park in 1896 (also on display at the Intersecting Worlds exhibition). The final alliance was with Germany – an alliance that proved ‘fatal’, as it brought the Empire to its end. For more on this fascinating topic, Cornucopia has a significant library of Dr Mansel's books and articles covering different aspects.